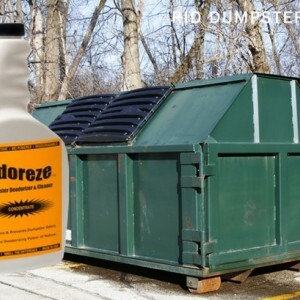 ODOREZE Natural Dumpster Odor Eliminator & Cleaner: 32 oz. Concentrate Makes 128 Gallons Summary Eliminate waste odor using the power of nature. Odoreze™ Dumpster & Chute Odor Eliminator Spray will remove waste smell without harmful fragances. This bio-based concentrated dumpster deodorizer makes 64 gallons & really works! Dumpster smell doesn't stand a chance. Features & Benefits • Removes dumpster smell instead of masking them • Bio-based deodorizer made from natural ingredients • No carcinogens, phosphates or harmful chemicals • Biodegradable, non-toxic, eco-friendly & effective • Economical- only costs 45 cents/working gallon • Made in USA Dump Nasty Dumpster Odors Forever! Dumpsters may be an efficient way to deal with your business’s trash, but one thing is for certain: they can smell really nasty! These trash receptacles feature any number of odorous elements, from rotting food waste to chemicals to gases to animal waste and beyond. Thankfully, our product makes dumpster odors an issue of the past! Odoreze ™ Natural Dumpster Odor Eliminator & Cleaner is the eco-smart chute and dumpster smell solution that destroys these odors permanently instead of masking them with fragrance. The result is a dumpster that will not make you gag every time you go near it! Use our eco-friendly, non-toxic, and non-flammable product by diluting 2-4 teaspoons Odoreze™ super concentrate/gallon water to make your odor-destroying working solution. Then spray the deodorizing solution in the dumpster and chutes plus on any other outdoor surface to the point of saturation in a sweeping motion. Repeat periodically, if necessary, until all the odors are eliminated. Odoreze ™ is very economical and will save you tons of money--it costs a mere 45 cents per working gallon Odoreze ™ Natural Dumpster Odor Eliminator & Cleaner is made from pure bio-based ingredients to deliver chemical-free and effective dumpster odor removal that is safe for landfills. It does not contain a single toxin that harms the environment and is biodegradable as well. 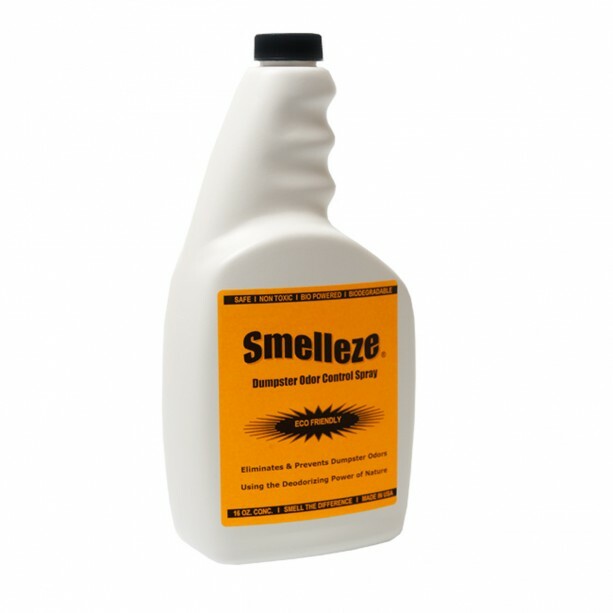 Our product breaks down odors, organic waste and grease while reducing flies, so use it to deodorize and clean dumpsters plus chutes, loading docks, trailers, walkways, driveways, parking lots, and the concrete pads under dumpsters. 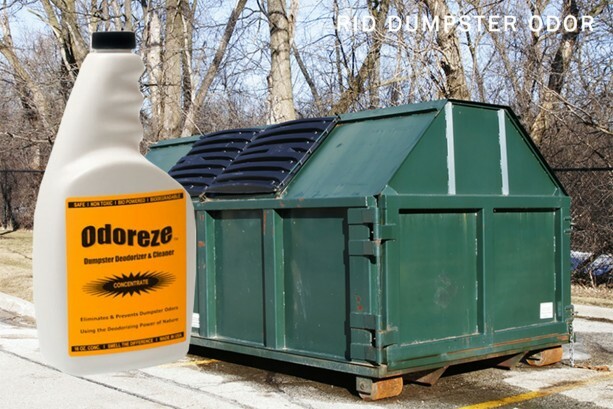 Eradicate dumpster and chute smells for good--purchase Odoreze ™ Natural Dumpster Odor Eliminator & Cleaner today! !